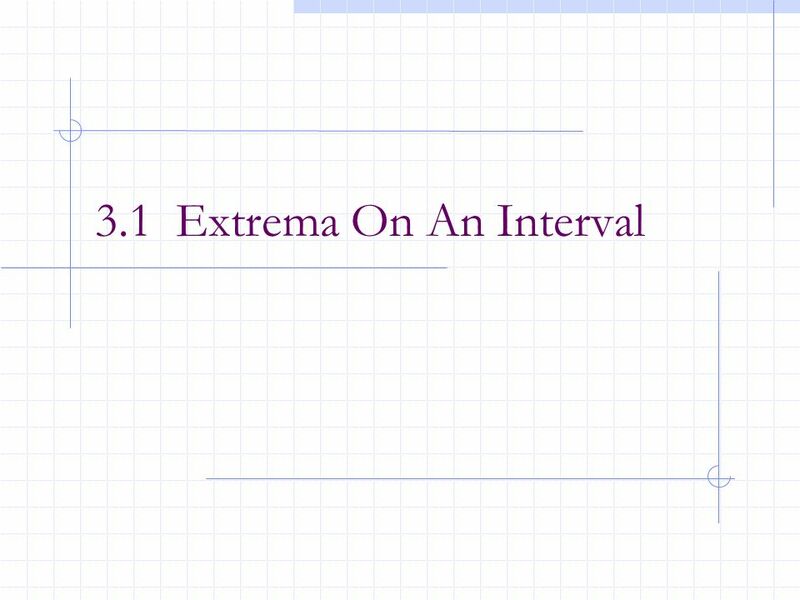 3.1 Extrema On An Interval. 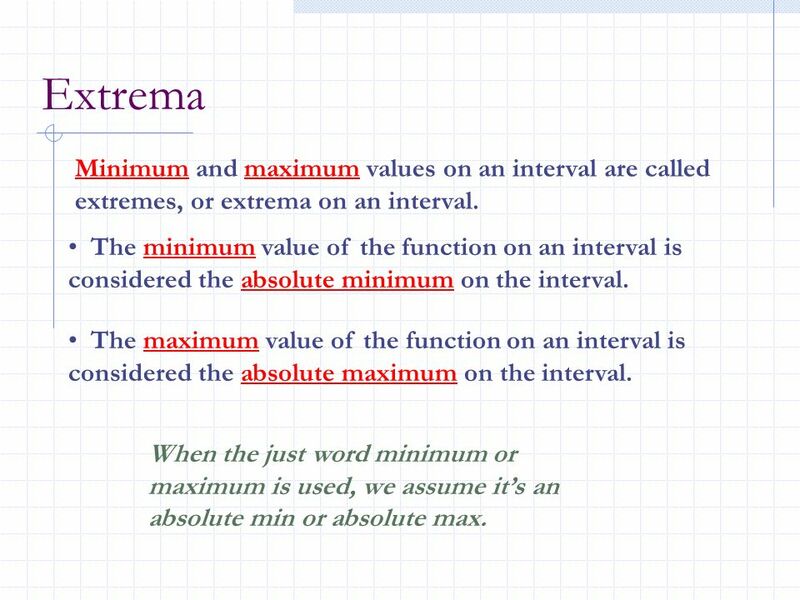 4 Extrema Minimum and maximum values on an interval are called extremes, or extrema on an interval. The minimum value of the function on an interval is considered the absolute minimum on the interval. The maximum value of the function on an interval is considered the absolute maximum on the interval. When the just word minimum or maximum is used, we assume it’s an absolute min or absolute max. 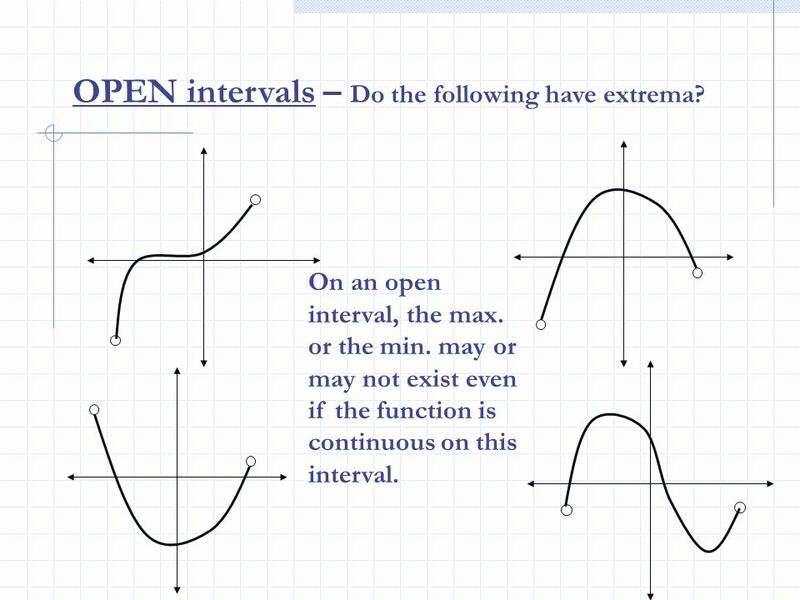 5 OPEN intervals – Do the following have extrema? On an open interval, the max. or the min. may or may not exist even if the function is continuous on this interval. 6 CLOSED intervals – Do the following have extrema? On a closed interval, both max. and min. 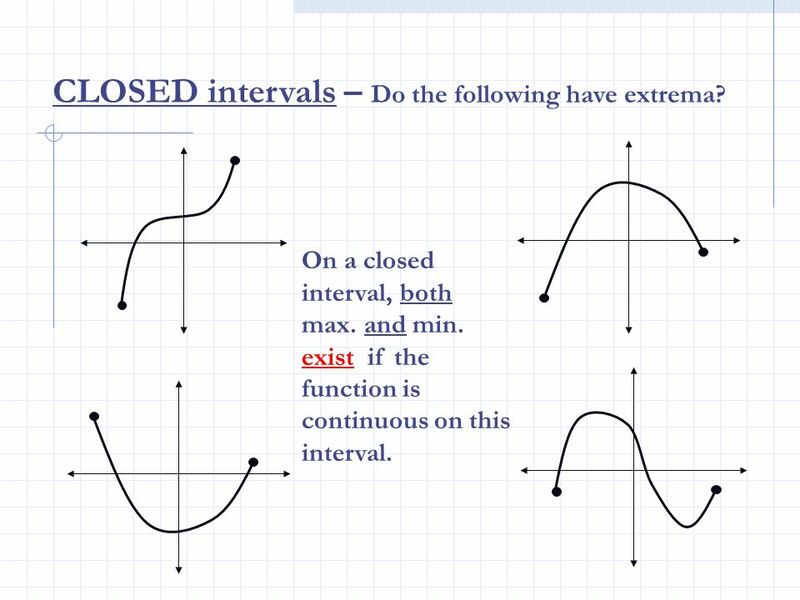 exist if the function is continuous on this interval. 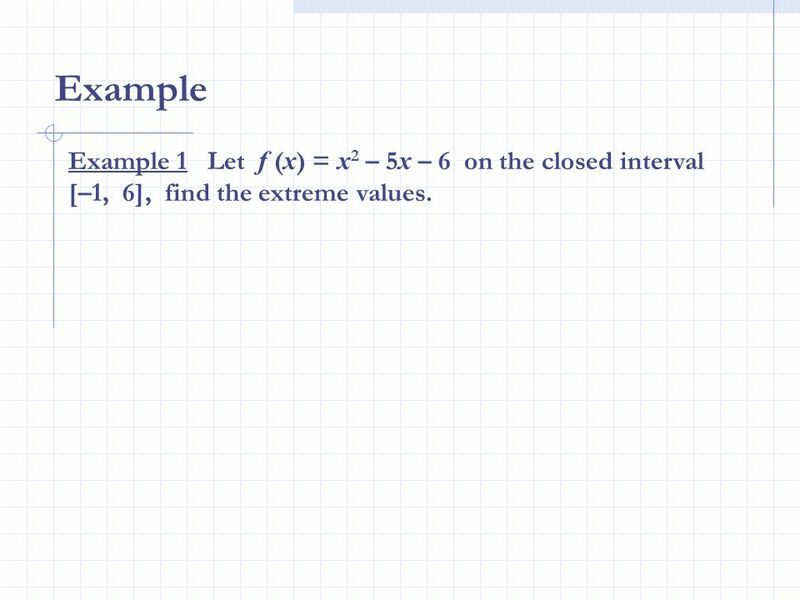 8 Example Example 1 Let f (x) = x2 – 5x – 6 on the closed interval [–1, 6], find the extreme values. 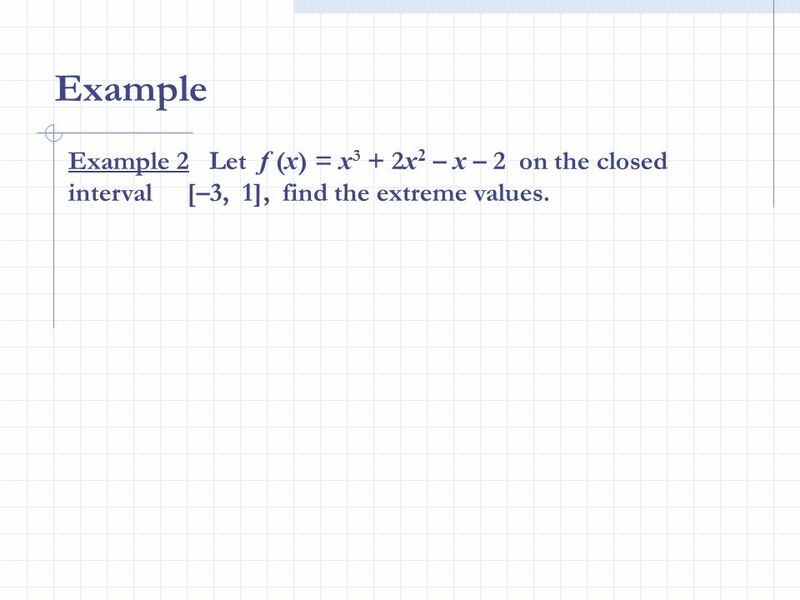 9 Example Example 2 Let f (x) = x3 + 2x2 – x – 2 on the closed interval [–3, 1], find the extreme values. 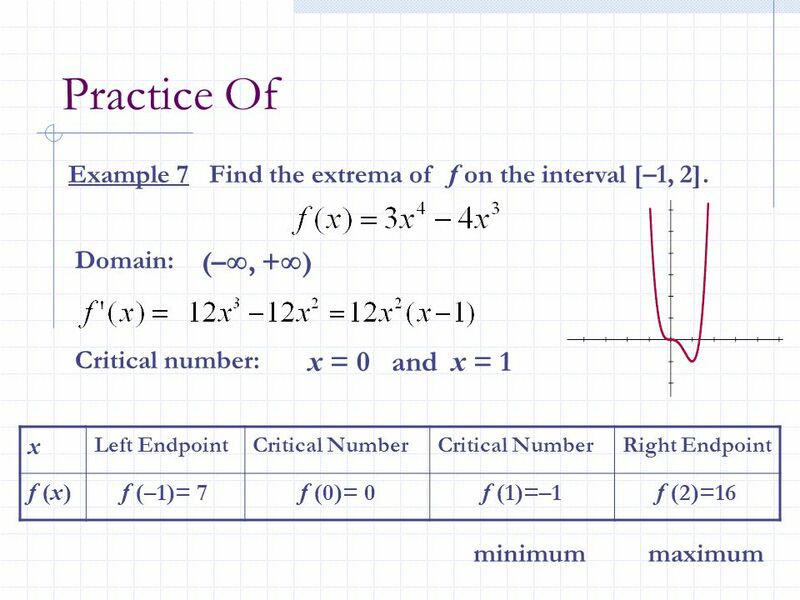 10 Example Example 3 Let f (x) = x3 + 2x2 – x – 2 on the closed interval [–3, 2], find the extreme values. The (absolute)max and (absolute)min of f on [a, b] occur either at an endpoint of [a, b] or at a point in (a, b). 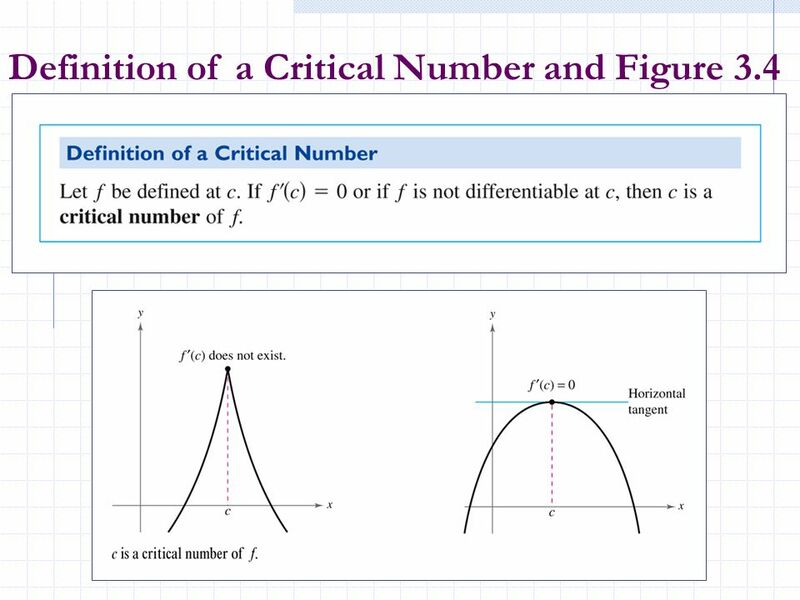 13 If there is an open interval containing c on which f (c) is a maximum, then f (c) is a local maximum of f. If there is an open interval containing c on which f (c) is a minimum, then f (c) is a local minimum of f. When you look at the entire graph (domain), there may be no absolute extrema, but there could be many relative extrema. 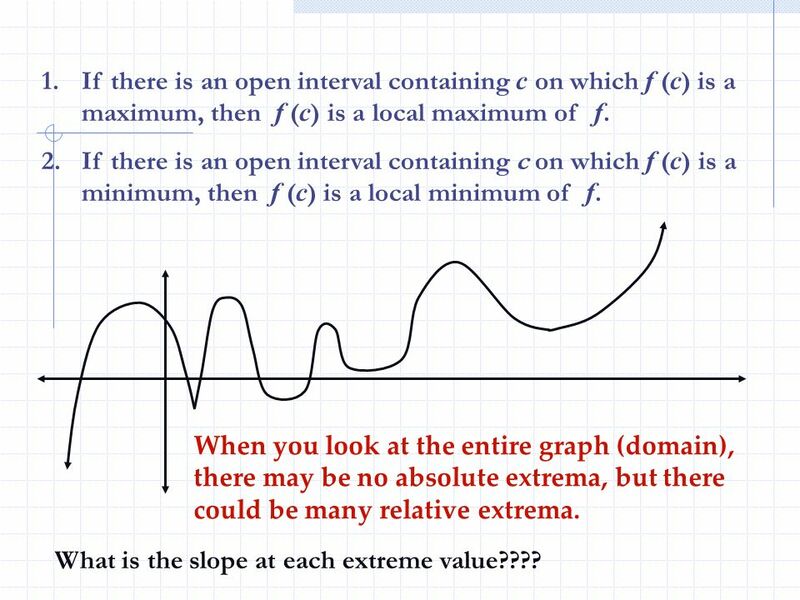 What is the slope at each extreme value???? 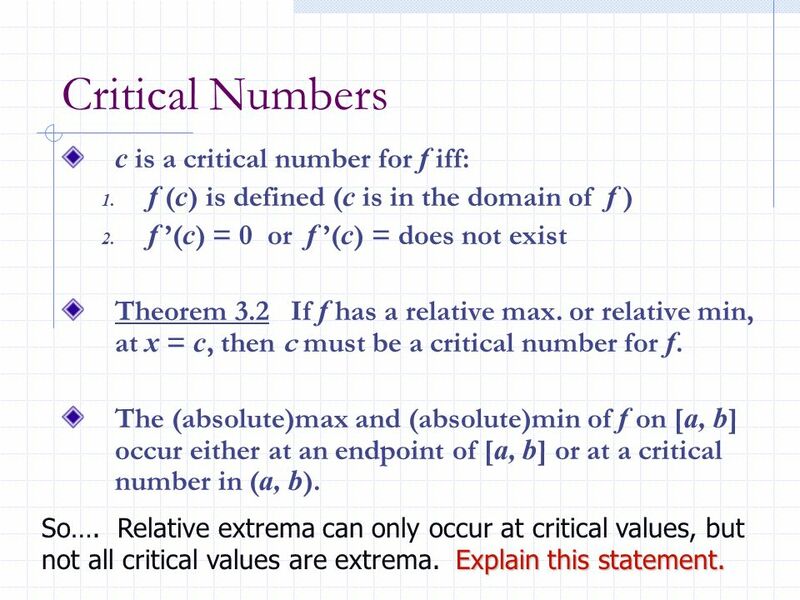 f (c) is defined (c is in the domain of f ) f ’(c) = 0 or f ’(c) = does not exist Theorem If f has a relative max. or relative min, at x = c, then c must be a critical number for f. The (absolute)max and (absolute)min of f on [a, b] occur either at an endpoint of [a, b] or at a critical number in (a, b). So…. 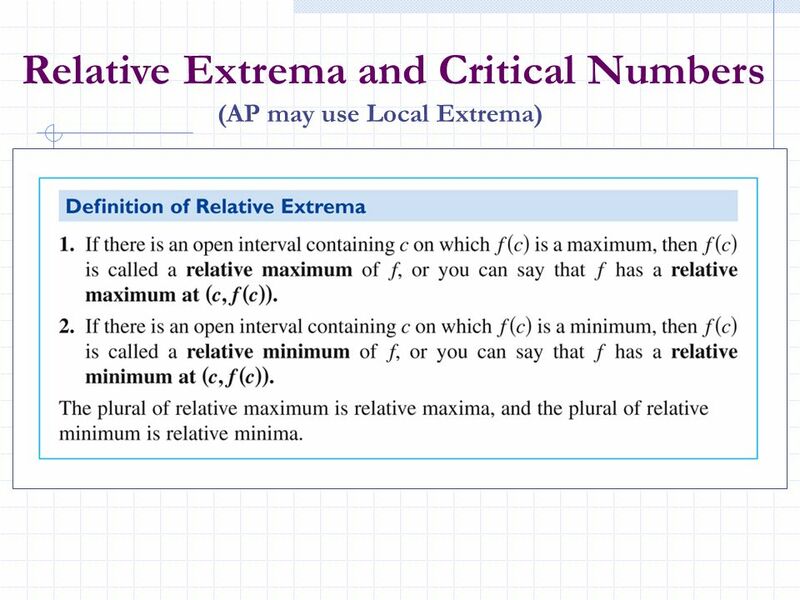 Relative extrema can only occur at critical values, but not all critical values are extrema. Explain this statement. Make sure f is continuous on [a, b]. 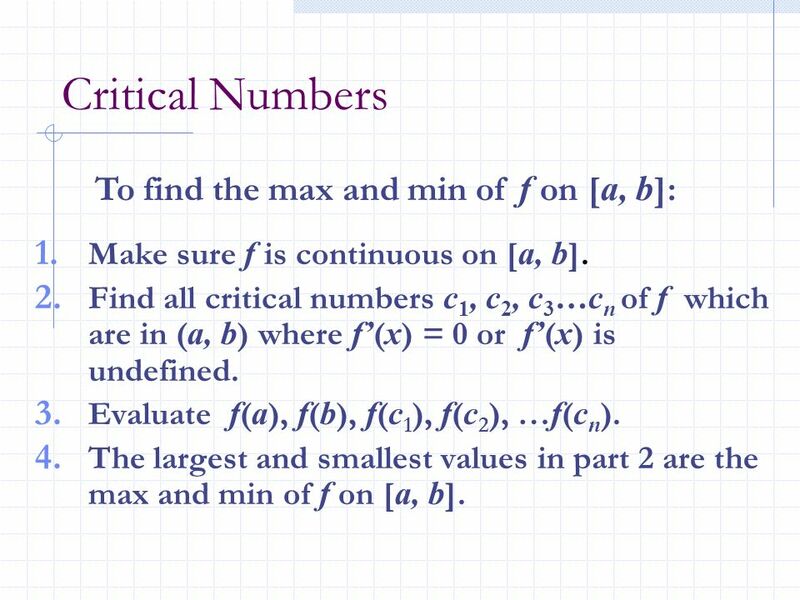 Find all critical numbers c1, c2, c3…cn of f which are in (a, b) where f’(x) = 0 or f’(x) is undefined. Evaluate f(a), f(b), f(c1), f(c2), …f(cn). The largest and smallest values in part 2 are the max and min of f on [a, b]. 2. 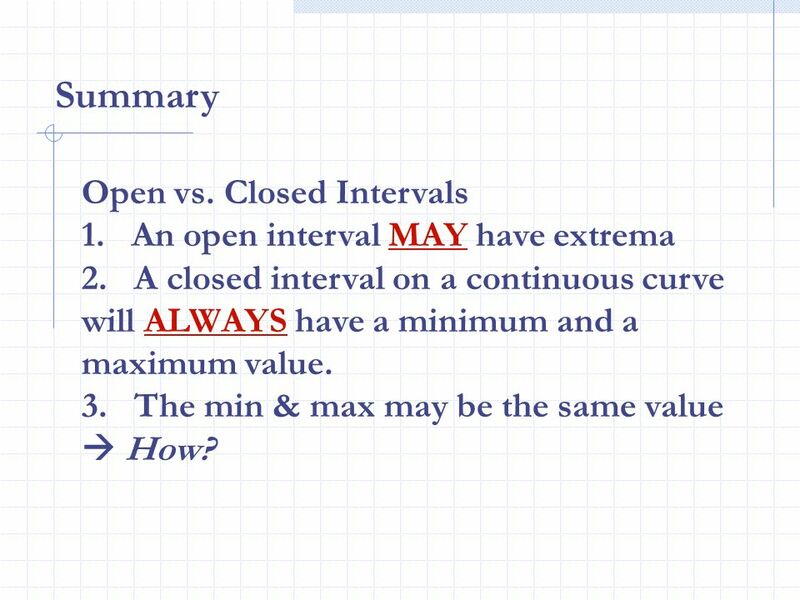 A closed interval on a continuous curve will ALWAYS have a minimum and a maximum value The min & max may be the same value  How? 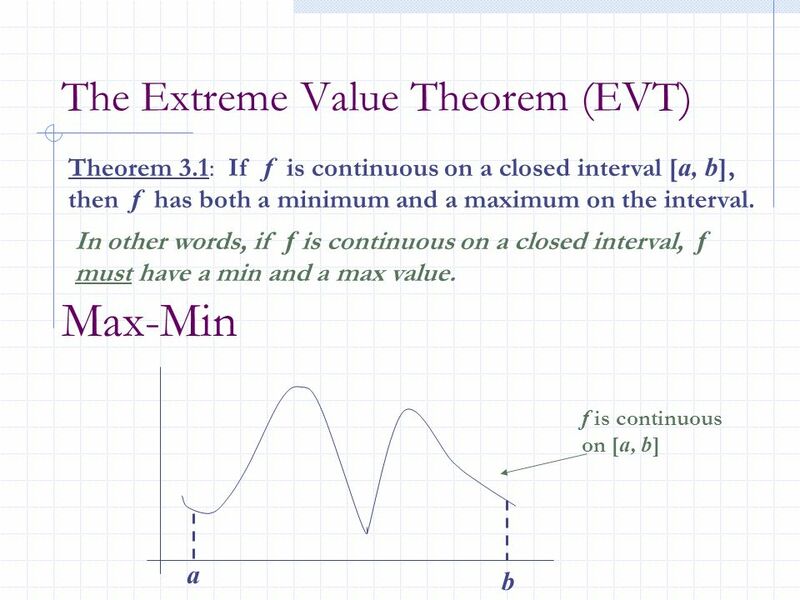 Download ppt "3.1 Extrema On An Interval." Business Calculus Extrema. 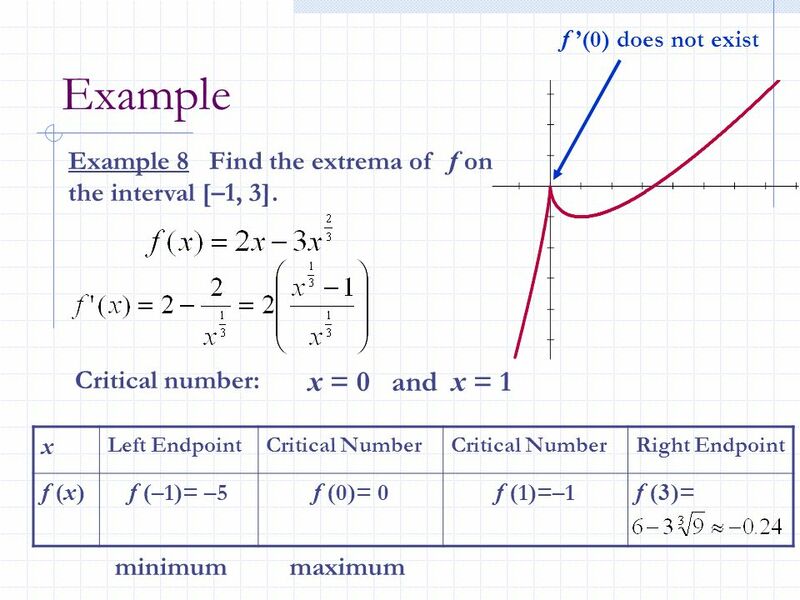 Extrema: Basic Facts Two facts about the graph of a function will help us in seeing where extrema may occur. 1.The intervals. 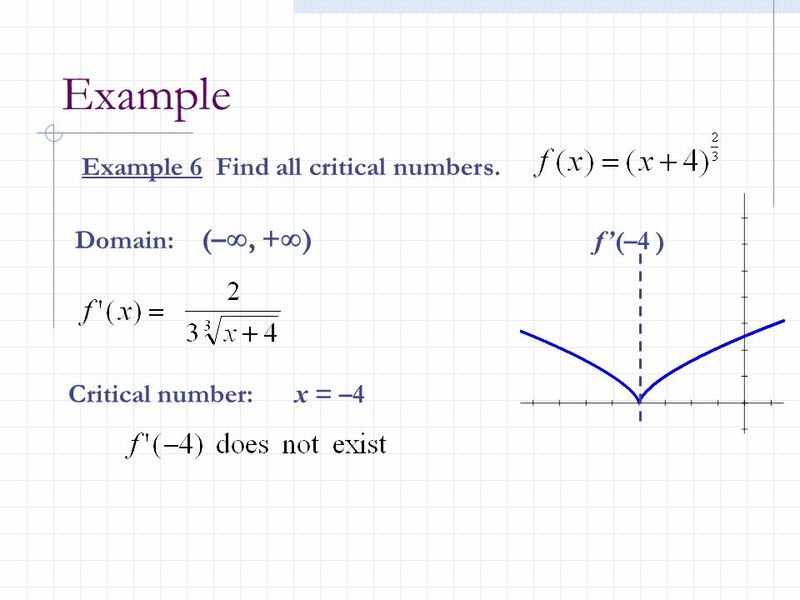 First Derivative Test, Concavity, Points of Inflection Section 4.3a. 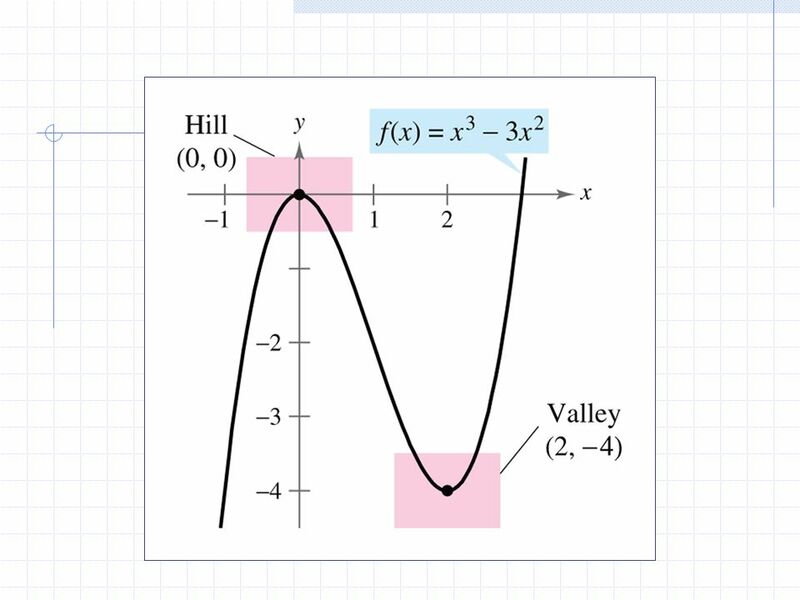 Is the shape below a function? Explain. Find the domain and range. 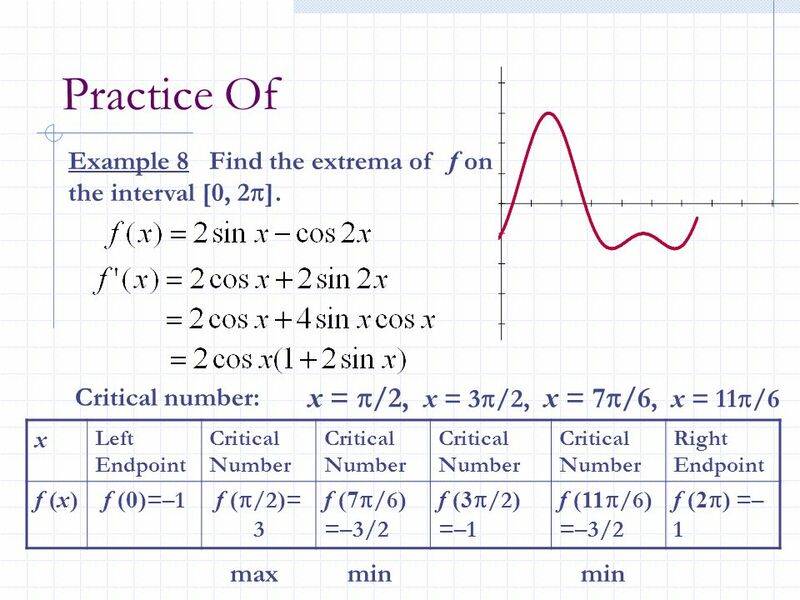 Section 3.1 – Extrema on an Interval. Maximum Popcorn Challenge You wanted to make an open-topped box out of a rectangular sheet of paper 8.5 in. by 11. 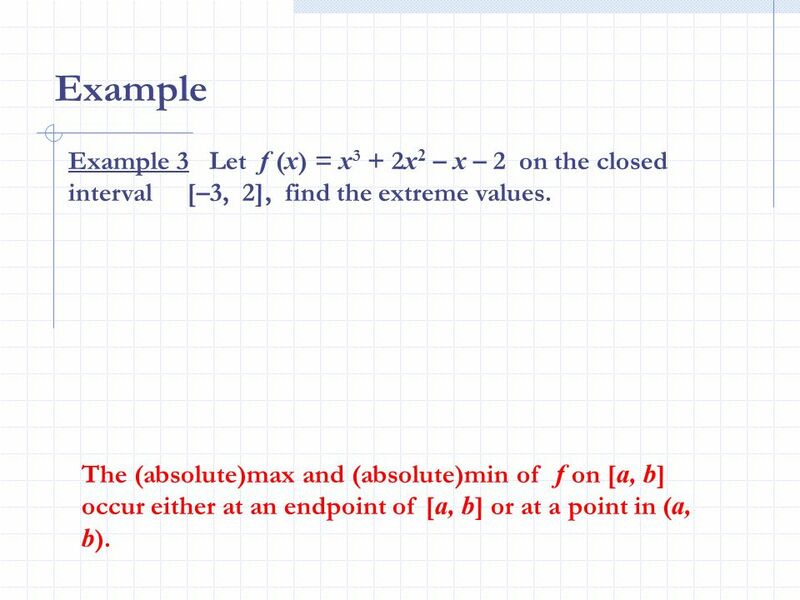 12.5: Absolute Maxima and Minima. 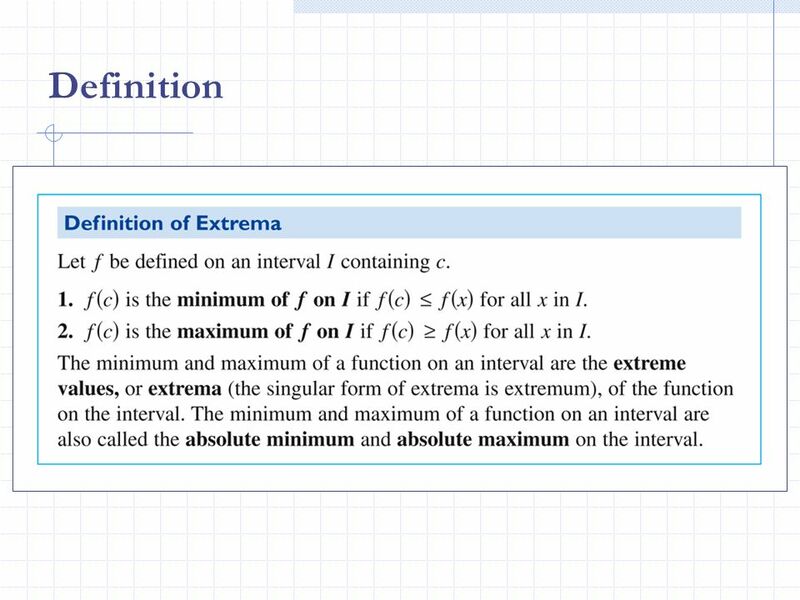 Finding the absolute maximum or minimum value of a function is one of the most important uses of the derivative. For. 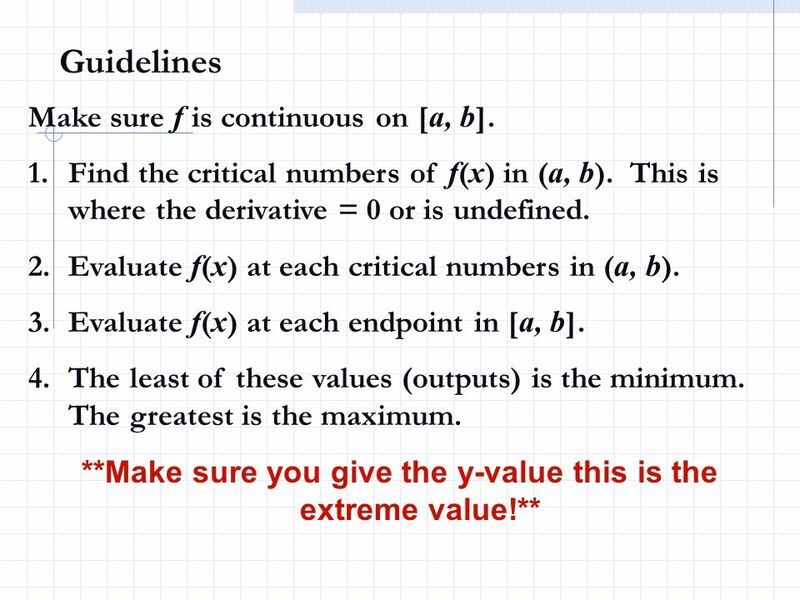 4.1 Extreme Values of Functions. 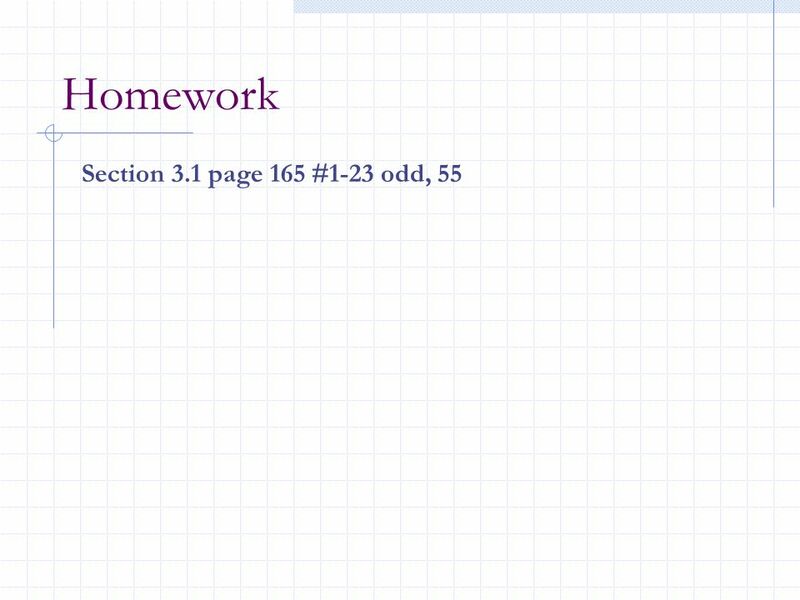 The textbook gives the following example at the start of chapter 4: The mileage of a certain car can be approximated. 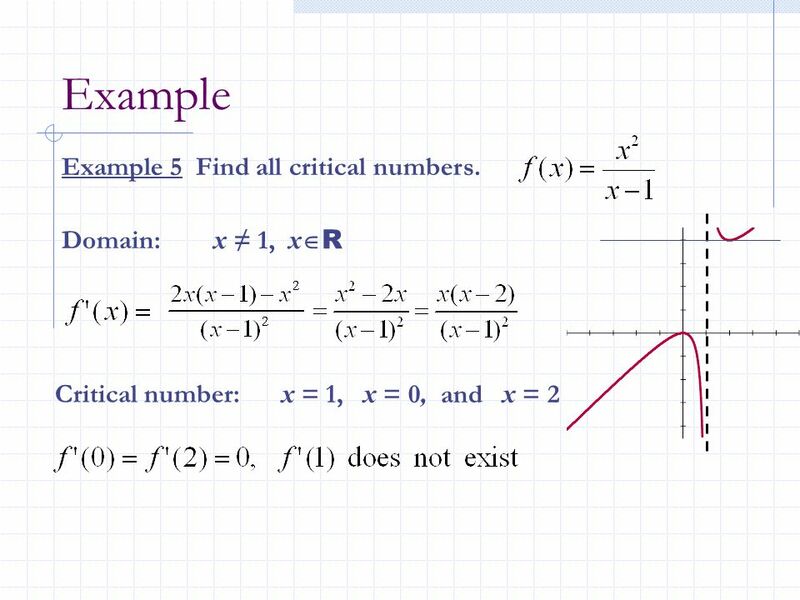 1 Concavity and the Second Derivative Test Section 3.4. 4.1 Extreme Values for a function Absolute Extreme Values (a)There is an absolute maximum value at x = c iff f(c)  f(x) for all x in the entire domain. 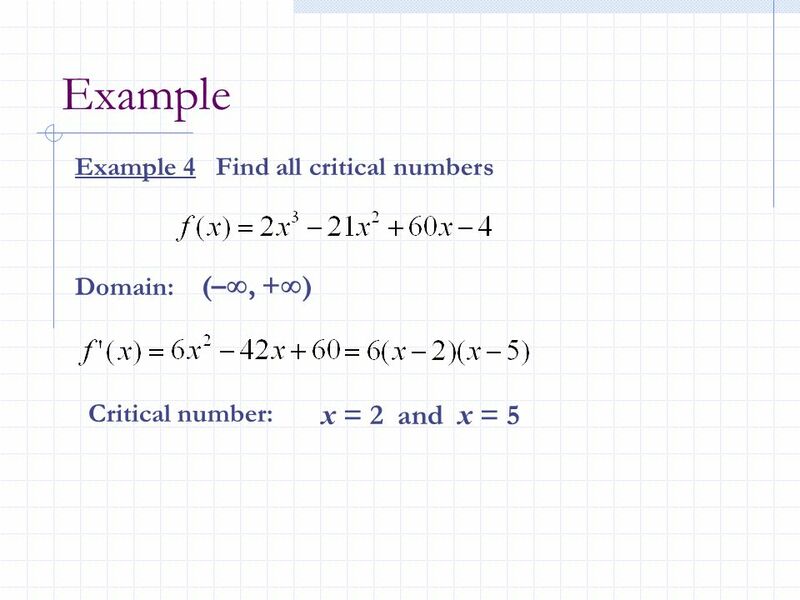 Clicker Question 1 What are the critical numbers of f (x ) = |x + 5| ? A. 0 B. 5 C. -5 D. 1/5 E. It has no critical numbers. 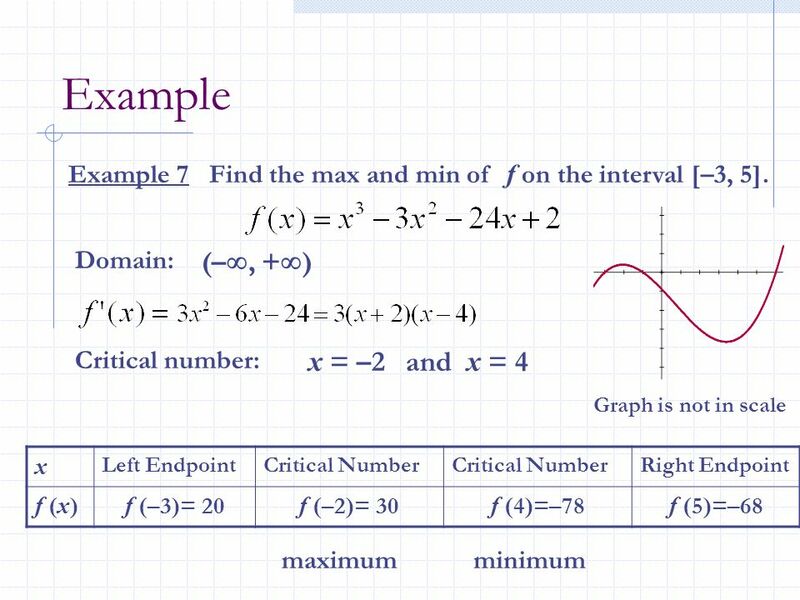 Chapter 5 Graphing and Optimization Section 5 Absolute Maxima and Minima.